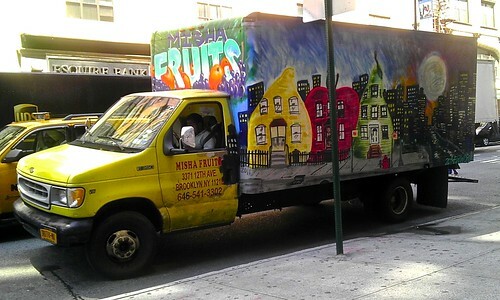 Look, It’s The Misha Fruits Truck! 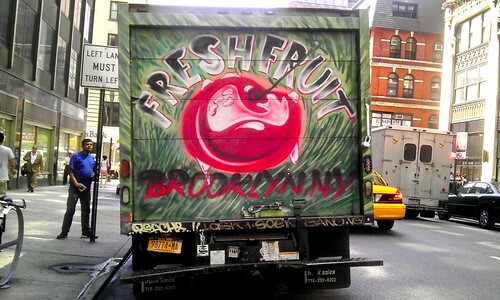 It’s just an old delivery truck that is used to transport fruit to the shops of New York City. 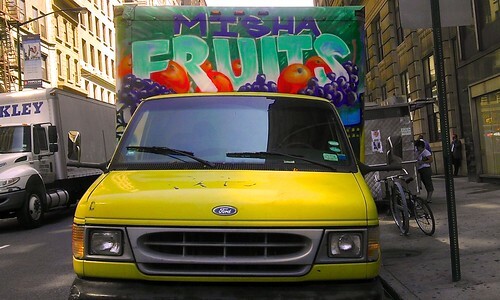 But when the Misha Fruits driver is at work, people notice. That’s because most of the vehicle is covered with an elaborate display of graffiti-style artwork. The front of the truck is emblazoned with the name of the company, partially hidden by enormous oranges and grapes the size of a man’s head. The right side shows a green monster (perhaps it is a bit of mold) and a colorful, stylized word which is, to me, indecipherable. 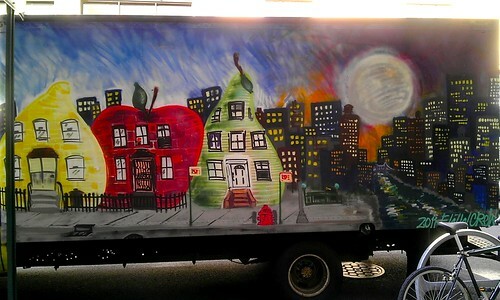 The truck’s rear is painted with an humongous, glistening cherry and the word “fruit.” And the left side is shows a panorama of the sun setting behind a bustling city where the houses are shaped like pieces of fruit. The truck is parked on Court Street in Downtown Brooklyn. The writing, and the creature shown, are mysterious. I want to live in an lemon-shaped house. Another view of the fruity cityscape. You are currently browsing the Blather From Brooklyn blog archives for July, 2012.